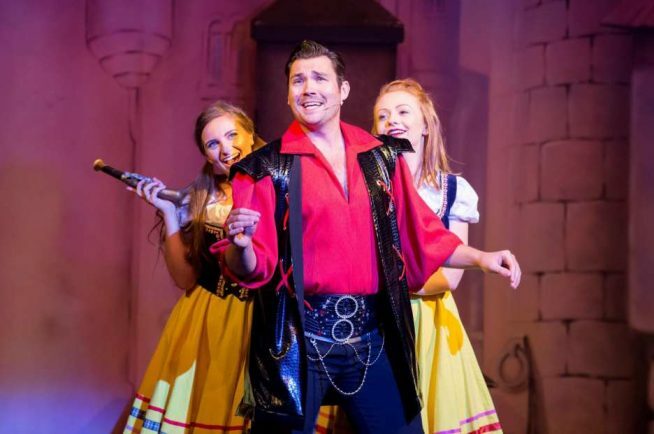 Sam Attwater as Gaston with 'The Girls' Nicole Lockwood-West and Lizzie Brown. THROW away the Christmas TV schedules as all the entertainment you need this festive season is on stage at the Palace Theatre. Hand on heart, I can’t see anything matching it for fun and frolics – and that’s not just because they gave the Redditch Standard a name check when we did our review on Sunday. Put simply the entire production is a triumph across all levels and all ages as well as being a brilliant advertisement for live theatre. Live on stage instead of in your sitting room, the laughs are louder, the colours brighter, the Beast scarier, and all building to thunderous – and well deserved – applause at the final curtain. So often it’s the baddie who gets all the best lines and TV star Nicole Faraday’s Hagwitch made the most of it, milking the hisses and boos of the audience and stealing the show in the process. Sam Attwater’s pelvis thrusting heart throb Gaston also proved a hit, not least for the tumble he took down the stairs at the end. If it was part of the show he’s a true acrobat, if not he did brilliantly to regain his feet! Tony Rudd as Ruddles kept the laughs coming ably supported by Adam Daye’s panto dame Madame Cherie Trifle and Andrew Haynes’s Professor Crackpot. Natalie Turner’s Belle deserves a special mention – she really is well nigh perfect – while Morgan Hughes performs wonders as both Bonzo the Dog and Fairy Rosebud – yes, it really is that kind of show! However what raises this performance a further notch above the rest is the quality of the supporting cast – the Pantomime Dancers and Pantomime Children – who danced, sang and acted their hearts out. Pinch yourself – Redditch has got one of the best pantos in the country at the Palace Theatre – it’s on stage now until December 31. For tickets (priced from £14) call 01527 65203 or visit http://www.redditchpalacetheatre.co.uk/ .